Hello! My name is Lórien Eck. I am an artist and have been creating at least since I was three years old! And I am an award-winning educator who has taught visual arts in the Los Angeles public schools and internationally for over 11 years! I am here on Patreon because this will give an opportunity to those who appreciate my artwork and creative style of teaching art to acquire artwork whilst supporting arts education for all! A bit about my background, I was born in Los Angeles and raised in Laguna Niguel, California. I graduated from San Francisco State University (B.A. Studio Art), St. Lawrence University, New York (M.Ed. ), Otis College of Art and Design, and CSU International Programs in Florence, Italy. I maintain a California State Teaching Credential and National Board Certification in Art, Adolescence to Young Adults. Now, more about where I am at now and why I am here seeking support. I was guided to move towards following my dreams to be a full-time artist and teaching artist for all who are passionate about unleashing the creative artist within and reclaim their own Divine inner artist! In March 2016, I launched my Official YouTube channel called "Art with Lorien" where I create and produce informative, inspirational and easy to follow NEW art making videos each week! I have a small team of two myself and my partner who does the camerawork, as well as a webmistress who is my technical wiz keeping my website current. My personal mission in life is to balance, heal, harmonize and beautify, bringing about these ideals through my original artwork and awakening the Divine inner artist in all! My passion and purpose is to inspire and support people in making transitions in consciousness. I offer this through both my spiritually textured abstract paintings and through helping people reclaim their inner artist, educating through the creative process both with groups and individuals on my "Art with Lórien" channel. Through my Art with Lórien YouTube channel, my aim is to inspire, encourage, inform and support my audience in building their art practice and to feel good through creative self-expression! I strongly believe that everyone is an artist, that anyone can learn to make art! If you were ever told you cannot draw or paint or heard any other limiting words that have stopped you from being creative artistically, I encourage you to reclaim your Divine inner artist now. It is never too late. ALL ages, genders and levels are welcome!!! I am inspired to keep the arts alive! 1. to provide interesting, inspiring content and 'create culture' through my "Art with Lórien" art tutorials and to continue to offer it for free on YouTube. For more information about my background, education and teaching experience, click here! 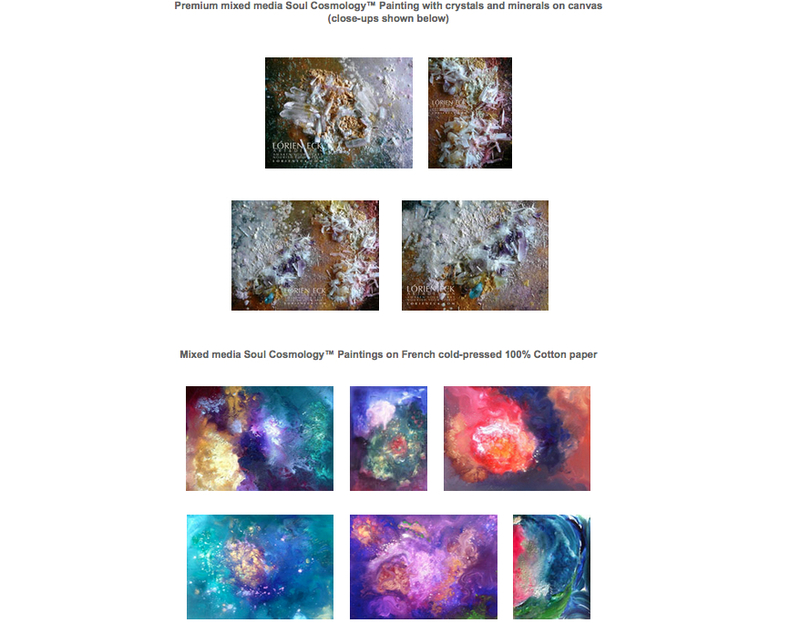 Premium Digital Wallpaper/Desktop/Screensaver Fine Art Pack: Choose your three favorite painting images! Most fine art images shown in Lórien Eck's Collections are available (excludes Soul Cosmology™ commissions). You will receive your artwork image/s in an email. File size will be approximately 2560 x 1440 pixels for each image. These digital images are not licensed for printing, sharing, or reproduction of any kind. All copyrights retained by Lórien Eck Art & Design. 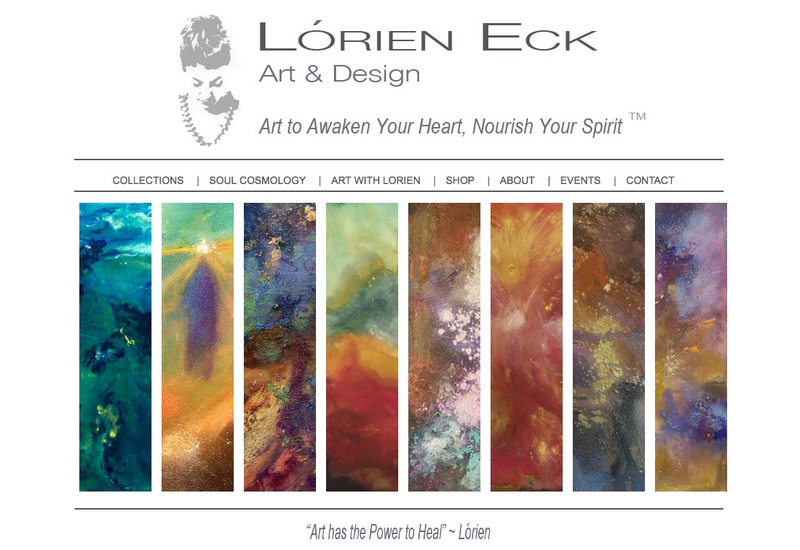 I am delighted to offer this gift of a set of my Limited Edition and Exclusive Lórien Eck Art & Design Note Card Sets! 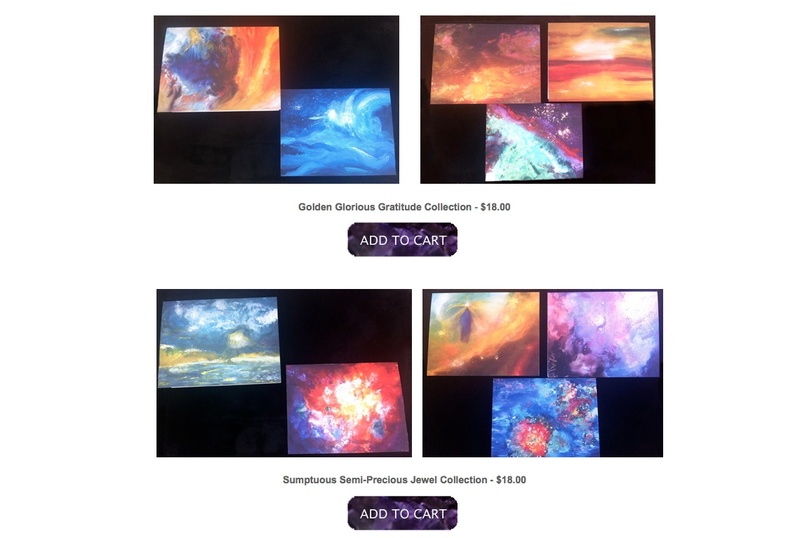 Exclusive Note Card Sets- Each set of 5 features unique original paintings from my Cosmic, Earth and Above,Transformation and Angelics Collections. Beautifully and vibrantly printed cover art and blank on the inside for your wonderous musings, imagination and appreciations. Share your favorite magical painting with your friends and loved ones! Dimensions are: folded 4" x 5.5" that open up with ample white space envelopes included for each note card. This Reward includes two of my Lórien Eck Art & Design Shop Gift Items! 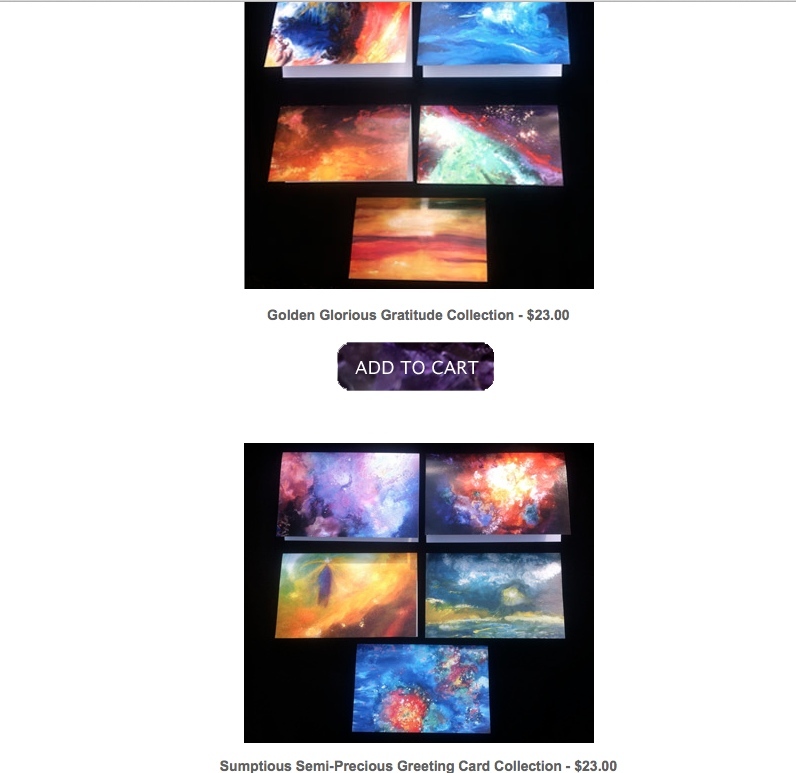 Limited Edition and Exclusive Lórien Eck Art & Design Glossy Greeting Card Sets! A Premium Digital Wallpaper/Desktop/Screensaver Fine Art Pack: Choose your three favorite painting images! 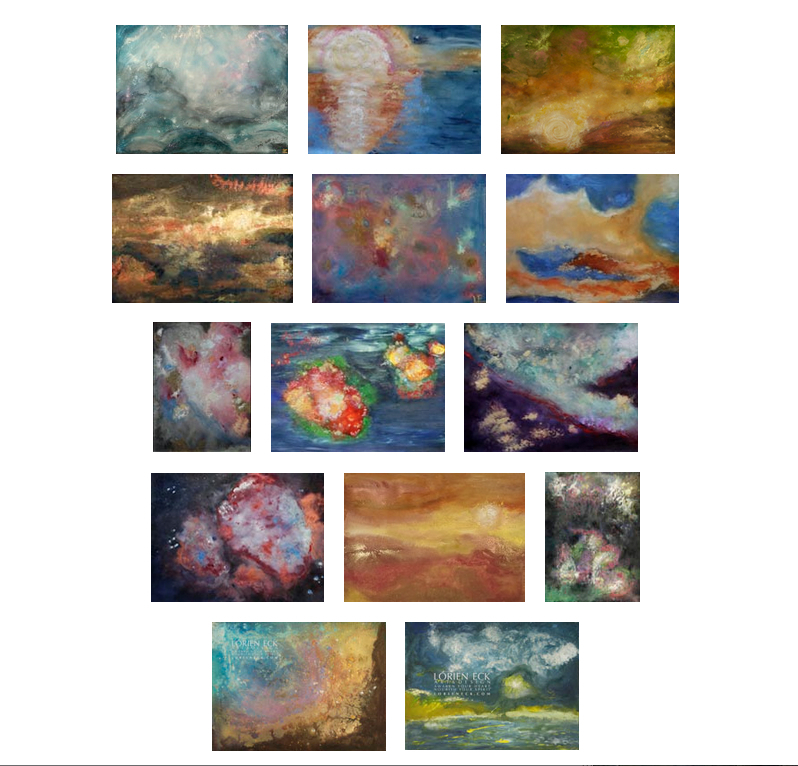 A Premium Digital Wallpaper/Desktop/Screensaver Fine Art Pack: Choose your 10 favorite painting images! Artist Proof, Limited Edition, Signed/Dated archival fine art print. There are 10 possible original art images to choose from (from available stock, while supplies last), all prepared under the supervision of and shipped directly from the artist. All reproductions purchased from Lórien Eck Art & Design are shipped with a Certificate of Authenticity signed by the artist. Select the one/s that match your mood and home aesthetic and lifestyle! One Artist Proof Signed/Dated archival fine art print. There are 10 original art images to choose from, (from available stock, while supplies last), all prepared under the supervision of and shipped directly from the artist. All reproductions purchased from Lórien Eck Art & Design are shipped with a Certificate of Authenticity signed by the artist. Select the one/s that match your mood and home aesthetic and lifestyle! 12 x 16 inches on Cold Press Paper, archival matted to 18 x24 inches and ready to frame and install in your home! I am more than delighted to be able to offer this very special reward to my generous Patreon supporters and friends. One 12 X 16 inches $250 (French cold-pressed 100% Cotton paper). A Soul Cosmology™ Painting is a customized mixed media painting that is a co-creation between the artist and the client-recipient. It is the epitome of a unique, individualized and exclusive painting that reflects your Soul’s unique beauty and light. With your Soul Cosmology™ commission, you will also receive a high-quality digital image suitable for use as a Wallpaper/Desktop Image. Soul Cosmology™ Painting is a unique that culminates in the co-creation in a painting that reflects your Soul's unique beauty, essence and light. Today customization is regarded as the epitome of luxury. My Soul Cosmology™ Painting taps this desire for exclusivity by allowing you the client-recipient to collaborate in the role of co-creator. Through your completed Questionnaire and our one-one consultation session, we combine forces for your Soul Cosmology Painting to come to life. Your Soul Cosmology™ is your essence of being or Spirit translated into a fine art painting -Matter- it is a potent reflection of you. It is a mirror and reminder of your bright inner light and Eternal beauty. As you engage with your painting, you awaken and are nourished. You begin to recognize "you" again, and open up to receive those most precious aspects of yourself: your true essence, harmony, beauty, personal power, strength, balance, and peace. • Illuminate a more profound recognition of your unique genius and gifts, and of the light that is YOU! It's easy! You will receive a welcome email and the journey of the creation of your Soul Cosmology™ Painting begins. 2. A Premium Digital Wallpaper/Desktop/Screensaver Fine Art Pack: Choose your SIX favorite painting images! My Elements Collection is inspired by my personal mission to balance, heal, harmonize and beautify our world. The natural elements are a simple and profound universal connection that we all share. From cooking our food with fire, to bathing and refreshing ourselves with water, to walking on the earth, our experience of the world is at its richest when we appreciate nature and the elements in their fullest expression. I personally invite you to collaborate with me as you create an environment that energizes your spirit, enhances your well-being, and uplifts the feelings of all who set foot in your home. This collection is a very special growing collection of original mixed media paintings that focuses on the Feng Shui Elements of Fire, Earth, Metal, Water and Wood. 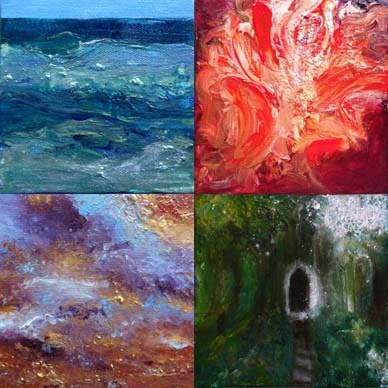 The Elements Collectibles™ are unique paintings created on 5 inches x 5 inches x 1.5 inches gallery-wrap archival canvas. A Premium Digital Wallpaper/Desktop/Screensaver Fine Art Pack: Choose your SIX favorite painting images! This reward to thank you for your support and love, includes three of my fine art offerings in larger quantity, for you and as gifts for your loved ones! It's easy! Just make your selection from the size options below and make your purchase. You will receive a welcome email and the journey of the creation of your Soul Cosmology™ Painting begins.on French cold-pressed 100% Cotton paper). It's easy! You will receive a welcome email and the journey of the creation of your (and the gift/s of the) Soul Cosmology™ Painting begins. WOW! How incredibly generous you are and I am happy to offer my valued original artworks in several ways! I am delighted to offer a $1000 credit exclusively to my supportive patrons on my current in stock inventory of mixed media, richly textured original paintings. 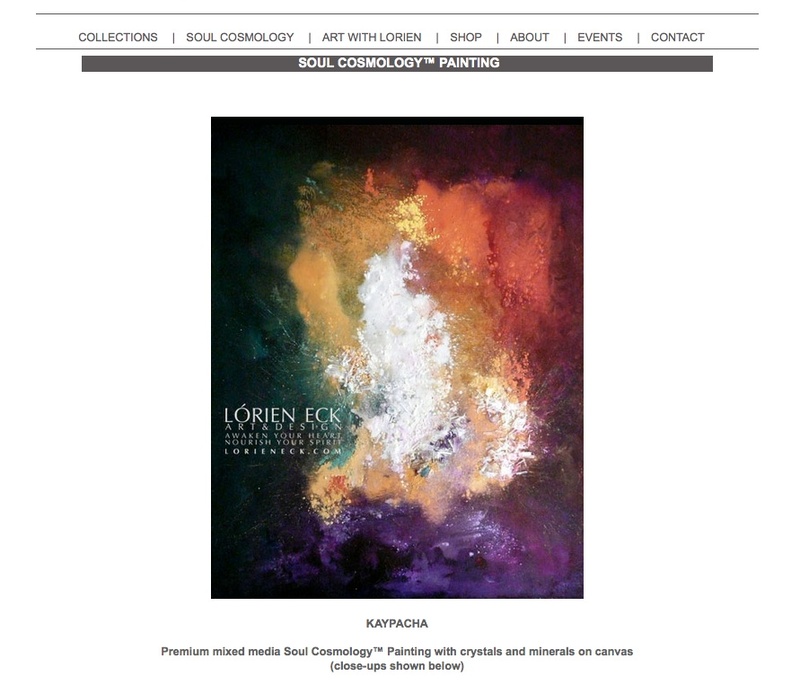 OR, a $500 credit towards a commissioned magical mixed media artwork by Lórien Eck on archival gallery-wrap canvas or fine art paper, your choice. Here are samples of my in stock inventory. All are 22" x 30" - Mixed media on paper. These paintings have been double matted, floated and in a white wood frame behind lightweight acrylic plexi glass and ready to install. I will ship to anywhere in the United States. Limited Edition and Exclusive Lórien Eck Art & Design Note and Glossy Greeting Card Sets- one of the Notes cards and the Greeting sets. We currently are using one purchased Canon VIXIA HF R700 Full HD Camcorder (White) on an old tripod for the front view and only camera for the recording of my Art with Lorien In the Studio episodes on YouTube. We require an additional Canon VIXIA HF R700 Full HD Camcorder (White) to record overhead while I am demonstrating the creation of art.